Individuals from Thailand can now join Wirtland more easily. 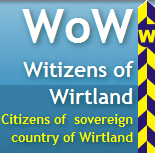 The Thai language has become the 6th language in which the Wirtland Citizenship Application Form is available, in addition to English, Spanish, Bulgarian, Portuguese, and Turkish. The translation was contributed by a witizen from Thailand. 2010's update: Currently the Application Form is available in 14 languages: English, Spanish, Bulgarian, Turkish, Portuguese, Russian, Thai, Korean, Dutch, Italian, Chinese, Japanese, Polish, Finnish. All the sample Forms can be viewed here. Tiff McGinnis, audio/video artist based in London, decided to donate her unique artworks to promote Wirtland. 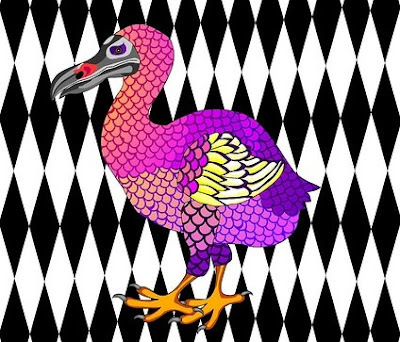 Tiff's colourful bird designs will be used for printing T-shirts and other garments with Wirtland flag, as well as Wirtland's postcards and postage stamps. 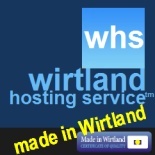 The latest Wirtland-Tiff McGinnis products can be seen here. Tiff McGinnis, also known as Crazy Girl, works in the field of contemporary audio, video and graphic art (her website: www.crazygirl.info) . She is the world's first artist who supports Wirtland with her artistic contribution, which is highly appreciated.